There were 541 press releases posted in the last 24 hours and 153,475 in the last 365 days. MOUNTAIN VIEW, CALIFORNIA, USA, August 29, 2018 /EINPresswire.com/ -- Regalix Inc.’s latest research report, ‘State of ABM 2018’, aims to understand the current ABM environment, the challenges it presents and future possibilities. To do so, survey responses from senior executives responsible for ABM campaigns across nine industries ranging from Computer Software and Internet to Marketing and Advertising were taken into account. Respondents included CXOs, VPs, Directors, and Managers from a variety of organizations, most of which have revenues exceeding $50M and employ over 200 people. Account-based marketing has been garnering significant attention of late. Positive results seen by those who implemented ABM have served to spread awareness of the practice and its benefits. Alignment between sales and marketing teams is another factor behind the emergence of ABM—such alignment allows organizations to support their customers more effectively, and is a natural consequence of properly implemented ABM. Considering the growing awareness of the benefits offered by ABM, it’s a good time to investigate how the B2B industry has taken to the practice. The research report brings some interesting statistics to light. For instance, just 57% of the organizations surveyed currently have an ABM strategy in place. Also, 41% of respondents described ABM as ‘somewhat ineffective’ in achieving their goals, although this is tempered by the fact that 54% of those practicing ABM have only been doing so for under a year. Unsurprisingly, increasing revenue is the primary goal of using ABM, as stated by 74% of participants. 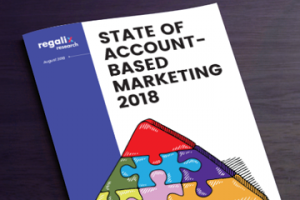 The report reveals many more insights into the current and possible future scenarios regarding ABM.